As I was running in Lincoln Park this morning I was thinking, a common occurrence and side benefit from this activity, about many different things; but thinking in part about inspiration. The running I do for exercise and good feelings, in spite of the occasional pain, I find to be an inspiration for thought and life. While running this morning I meditated on another source of inspiration: a friend whom I had the occasion to see yesterday. He is an inspiration to me in his own dedication to running (marathons, half-marathons and more), and it is this in part that encourages me to run myself and continue to be a runner. Is it this 'inspiration' that is the source of energy for living a life? Perhaps so, along with other sources it seems that it is a bit easier, after a morning on the running trail, to go about the regularities of another day of living this human life. Late in his life Hector Berlioz decided to create an opera based on Shakespeare's comedy Much Ado about Nothing. Berlioz had adored Shakespeare ever since attending a performance of Hamlet in 1821 (he encountered his wife to be at the same time). So it was that, after a long career that included Shakespearean influenced works like his Romeo et Juliette, Berlioz began a to write what would become a delightful two act opera to end his career. Yesterday I attended a excellent performance of the opera by The Chicago Opera Theater. 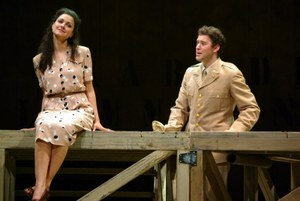 Particularly effective was the singing of the leads, Joseph Kaiser and Sandra Piques Eddy. The lovely arias, duets and trios reminded me that Berlioz was one of the greatest composer of French "melodies". The chorus was excellent and the only disappointment was the introduction of Shakespeare's own text in English for the spoken dialog. This was not due to any shortcoming of the text itself, but rather the inability of the actors to project the words effectively, making for some difficulty in following the wonderful verbal wordplay. That aside, it was a wonderful afternoon of opera with Berlioz and Shakespeare the best of guides. This novel is partly a meditation on the vagaries of love, or rather being in a situation where you have two relationships and are unable or unwilling to choose between them. But Ivan Klima, in his beautiful novel provides much more: an analysis and meditation on the need to remember the events in our life and, for this writer, the need to write about them, recording the existence so that the memories are not lost. He provides a running commentary from the narrator on the thoughts and writings of Franz Kafka. Filled with autobiographical references, the novel engages the reader in the meaning of love and live, of communication with others when you are living in a world that borders on the "Kafkaesque". Diverse scenes with his coworkers, his wife and mistress, even his dying father resonate with the reader and coalesce to form a vivid picture of his world. That he succeeds in all of this is a tribute to the genius of Klima and the spirit that he exhibits in the telling. Subtitled Discovering a Forgotten Passion in a Paris Atelier, this is a delightful and even captivating book especially for those who enjoy playing or listening to the piano. The author, Thad Carhart, has an engaging style and a beautiful story about the spirit of a place that seems almost like a fairy tale in the telling. Perhaps living in Paris gives you that feeling, as it is certainly captured by this memoir. Thankfully, according to the acknowledgements by the author, he was encouraged by Alberto Manguel, himself a fine editor and observer of elegant prose. Carhart's prose is a wonder and the spirit engendered in reading it certainly rekindled and expanded my own love for all things pianistic. 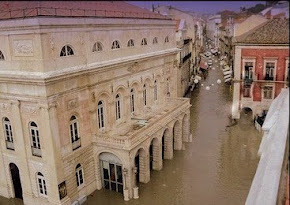 The Piano Shop on the Left Bank by Thad Carhart, 2001. Random House, New York. This novel by Louis Auchincloss is considered by many to be a modern classic. Whether you share that opinion or not, I believe it certainly represents his best work in the genre. Using six different narrators, Auchincloss tells the life story of Francis Prescott, from his youth as a schoolboy to his death at age 85. As Dr. Francis Prescott, he is the rector (headmaster) and founder of an exclusive New England Episcopalian boys' school Justin Martyr (a famous prep school). The narrators' attitudes toward their subject range from veneration to hatred, thus providing the depth of character that infuses the book and elucidates effectively the somewhat larger-than-life central character. The book is both well written and compulsively readable. While not a particularly profound or deep book, it is an excellent, enjoyable read, and a fine introduction to this modern author. If you enjoy this novel I would recommend Auchincloss' short stories. How often do you find a novel starting with a discussion of Nietzsche's idea of eternal return? 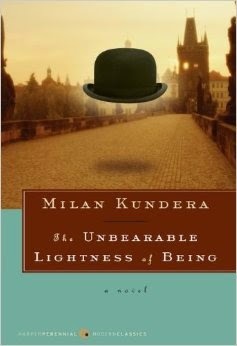 This is how Milan Kundera's novel, The Unbearable Lightness of Being, begins, and it becomes more complex and interesting as the novel continues into a tale of loves and lovers set against the background of Communist Czechoslovakia in the days before the fall of the iron curtain. Particularly important is the contrast of lightness and heaviness of this life as we ponder the nature of fortuity and fate in the lives of the characters. As always with Kundera, music and literature play an important role in the development of the themes with references to Beethoven's last quartets, the nature of fate as informed by Oedipus, and a pet dog named Karenin. It all comes together in the countryside as we see Tomas, the Doctor, give up his profession for love or for his principles, or for both. Challenging the reader, this author has created a puzzle of a book that is a delight to the reader who cherishes the world of ideas and their meaning for man. The Unbearable Lightness of Being, Milan Kundera. 1984, Harper and Row, New York. "The only thing that makes life possible is permanent, intolerant uncertainty: not knowing what comes next." 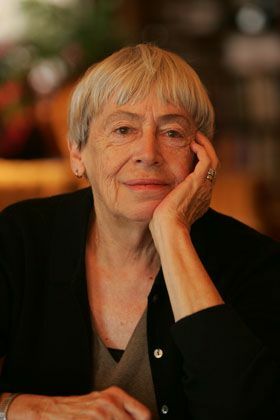 Simply one of the best writers of the twentieth century, Ursula K. Le Guin is not as well known as many more "literary" authors because her main body of work was wholly within the genre of science fiction and fantasy. Several of her books are among my favorites, including The Left Hand of Darkness, The Dispossessed and The Word for World is Forest. She expanded the genre by treating themes like the nature of freedom, sexuality and the interaction of cultures within the context of alien worlds, far across space and time. She is a consummate story teller while her prose epitomizes the best in writing. As a result you can enjoy her writing and easily understand her message even if you are not a fan of the genre. As a reader I am glad that I encountered her writing and will continue to return to it. David Ferry, in 1992, conceived and produced this sparsely written, but effective, translation of the Epic of Gilgamesh into modern verse. The story is well known, at least from the influence it has had on later works such as the Bible (the flood) and other epics. It was the first to develop themes that would continue through western literature, such as the use of the "double" and the contrast of civilization, represented by the city, with the wilderness. Ferry's modern translation allows these themes to come through the text without using a precise literal line by line translation. A very readable rendition of the original western epic. Gilgamesh: a new rendering in English verse by David Ferry. Farrar, Straus and Giroux, New York, 1992. This amazing and moving book is subtitled, An Odyssey of War, Exile, and Redemption. Written by Wesley Adamczyk, it is the riveting personal account of Wesley as a young boy as he and his family are torn from their home in eastern Poland during and following World War II. They are forced to survive in strange lands far from their homeland. How young Wesley survives is a story of courage and luck, of opportunities both found and created from his desire to live a free and a humane life. That he succeeds is due to both his will and his family's help and I wondered as I read why such an ordeal should have happened. But it did happen and I was moved by this book to be thankful for my own life. In 1911 Bela Bartok composed the opera Duke Bluebeard's Castle with a libretto by Bela Balazs. Yesterday I attended a brilliant performance of this gem from the early twentieth century as produced by the Chicago Opera Theater. With musical connections to both Debussy and Strauss, Bartok is beginning with this opera to develop his own musical identity. The brilliant orchestration had sounds thick with the resonance of brass, yet seemed almost lyrical and light at times - always foreboding as befits the story. Certainly the opera demonstrates Freudian roots as Bluebeard's new bride, Judith, insists that that he bare the secrets of his soul locked behind seven doors within the depths of his castle. As the opera unfolds the music soars. This performance was enhanced by the lofty talents of Samuel Ramey as the Duke and an excellent orchestral accompaniment under the baton of Alexander Platt. I was spellbound to the end. "unbounded music, absolute sound, a pleasant and happy all-encompassing, overpowering, window-rattling din to engulf, once and for all, the pain, the futility, the vanity of words." The orchestra responded to the music and the conductor with all the might that was required by this masterpiece. The transcendence of the spirit through music moved this listener to the halls of rapture once again. Irene Nemirovsky's novel is an amazing achievement that we are fortunate to have available more than fifty years after its creation. Left incomplete, the two parts that are finished plus the notes for the rest of her novel are impressive. She used music as her thematic foundation and portrayed individuals in their struggle to deal with the fall of Paris in 1940. In doing so she created a realistic and touching, almost cinematic, story of petty desire and courageous heroism. It is a beautifully written account of the experiences of several French individuals and families as they flee Paris in front of the oncoming German Army in 1940. The details and emotions are gripping and draw in the reader as the author explores the varied reactions to this horrific episode in history. I found this book disappointing. The author, Carlos Ruiz Zafon, has written a book with many plots and subplots that do not seem to cohere in a reasonable fashion. The result is ultimately dissatisfying. The language of the novel was strange at times and sometimes trite or hackneyed. Neither the scenes of violence (both graphic and jarring) nor the love scenes were portrayed successfully. 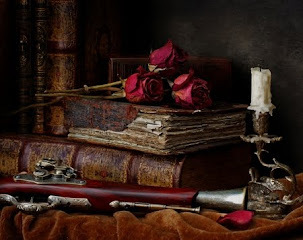 While the notion of a "Cemetary of forgotten books" is a lovely one, appealing to this reader, it was ignored for much of the novel which seemed to be appended to the concept rather than connected with it. The novel seemed to slow down in the middle without sufficient suspense to support it. 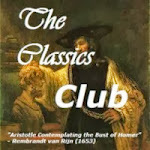 A much better book with a similar theme is Arturo Perez-Reverte's The Club Dumas. It is both more suspenseful and better written - a delightful, if not truly great, read. the Sphinx. Oedipus said, "I want to ask one question. made everything possible," said Oedipus. "No," she said. Man. You didn't say anything about woman."